I am changing the wave count at the daily chart level. I have more confidence in this wave count today. Sideways movement over the last week or so fits nicely as a barrier triangle. Now minute waves ii and iv are better in proportion, and the wave count has a better look. Minute wave ii was a very deep expanded flat and minute wave iv is a very shallow triangle; there is good alternation between them. I would expect a short fifth wave to follow the barrier triangle of minute wave iv. At 19.47 minute wave v would reach equality in length with minute wave i. As there is no Fibonacci ratio between minute waves iii and i it is more likely that minute wave v would exhibit a Fibonacci ratio with either of i or iii, and equality with minute wave i is the most common ratio. This target has a very good probability. Ratios within minute wave iii are: minuette wave (iii) is 0.40 short of 2.618 the length of minuette wave (i), and minuette wave (v) is just 0.04 longer than equality with minuette wave (i). This gives a little more confidence that this portion of the wave count is right. Redraw the channel about minor wave 1: draw the first trend line from the highs labeled minute waves ii to iv, then place a parallel copy on the low labeled mintue wave iii. I would expect minute wave v to end midway within the channel or about the lower edge, with midway more likely. While minute wave v is unfolding no second wave correction within it may move beyond the start of its first wave above 21.23. As soon as minute wave v may be seen as complete then the invalidation point must move right up to the start of minor wave 1 at 27.78. Minor wave 2 should last at least a couple of weeks and may be very deep. Intermediate wave (5) must subdivide as a five wave structure, either an impulse or an ending diagonal. So far the first five down for minor wave 1 is incomplete. If minor wave 1 completes as a five wave impulse then intermediate wave (5) must be unfolding as an impulse, because an ending diagonal requires all the subwaves to be zigzags. Minute wave iii is 0.30 longer than 2.618 the length of minute wave i. Ratios within minute wave iii are: there is no adequate Fibonacci ratio between minuette waves (iii) and (i), and minuette wave (v) is 0.40 longer than 0.618 the length of minuette wave (iii). 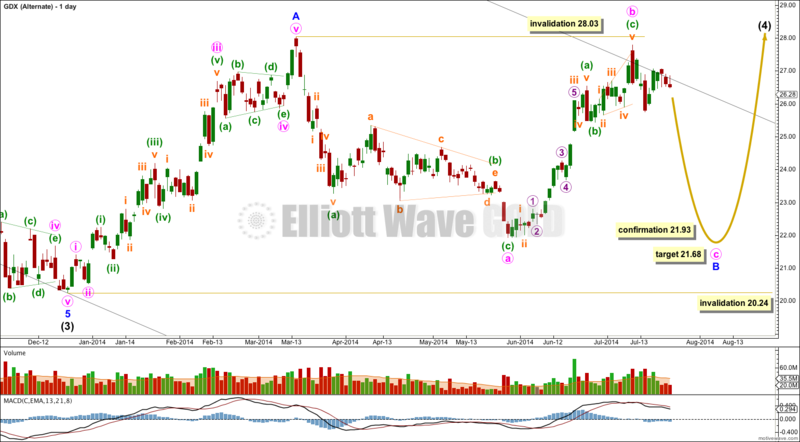 Minute wave ii lasted 21 days and was a deep 93% expanded flat correction of minute wave i. So far it looks like minute wave iv may also be an expanded flat, but it is much more shallow. Because there is no alternation in structure between minute waves ii and iv for this wave count, it is possible that my analysis of the end of minute wave iii and the start of minute wave iv is wrong. Minute wave iii may not be over and may yet move lower. However, because minute wave iii has a close Fibonacci ratio to minute wave i, and because within minute wave iii there is a good ratio with perfect alternation and almost perfect proportion between minuette waves (ii) and (iv) so far this wave count looks correct. It may be that minute wave iv continues sideways as a running triangle to provide alternation with the flat of minute wave ii, or it could be more time consuming as a double combination with the first structure a flat. Overall the structure for minor wave 1 down is incomplete. When this piece of sideways movement is done I would expect the breakout to be downwards. As expected GDX has moved lower. 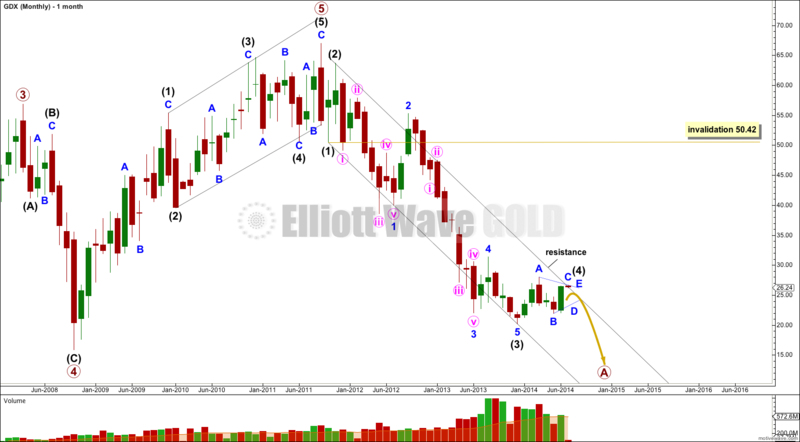 This Elliott wave count looks correct so far. We have some price confirmation with a new low below 25.59. At 22.32 minute wave iii would reach 2.618 the length of minute wave i. 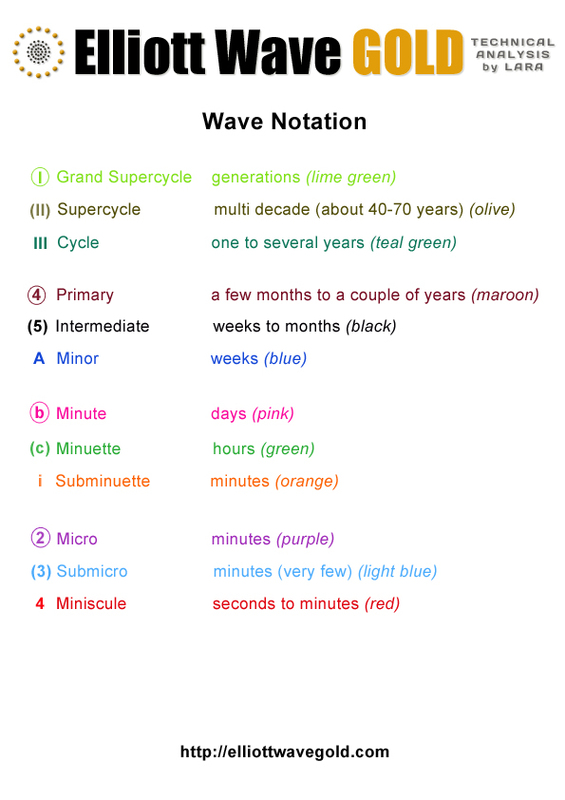 Ratios within minuette wave (i) are: subminuette wave iii has no Fibonacci ratio to subminuette wave i, and subminuette wave v is 0.6489 short of 0.618 the length of subminuette wave i. Ratios within minuette wave (iii) are: there is no Fibonacci ratio between subminuette waves iii and i, and subminuette wave v is 0.13 longer than equality with subminuette wave iii. 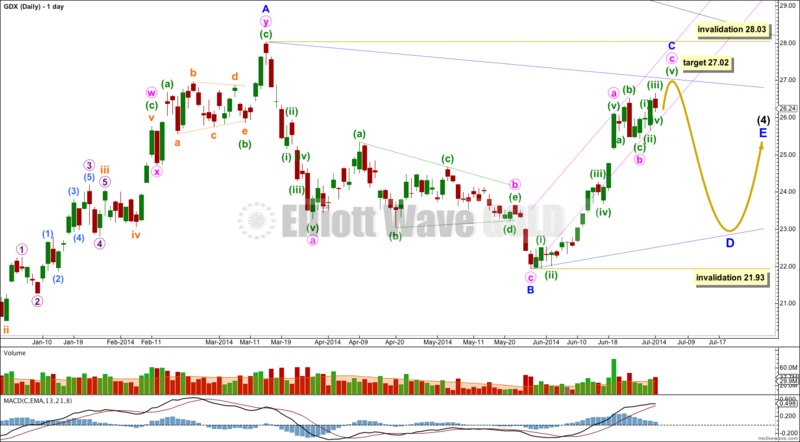 I am not sure if minuette wave (iv) is complete or not; if not, minuette wave (iv) could move price further sideways and higher but may not move into minuette wave (i) price territory above 25.75. 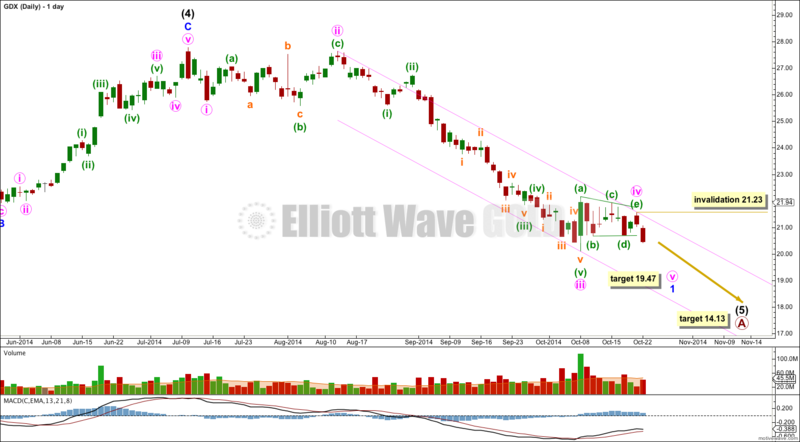 Minuette wave (ii) lasted four days and was a relatively deep 55% zigzag. Minuette wave (iv) may be a relatively shallow flat, triangle or combination. Minute wave ii was a very deep expanded flat. When minute wave iv arrives I would expect it to most likely be a very shallow correction of minute wave iii. I also expect minute wave iv may be a very shallow zigzag, triangle or combination; should be a sideways movement; would most likely last up to 21 days; and may be more brief than this if it is a zigzag as they do tend to be briefer structures. At this stage I would expect the target at 22.32 to be about one or two weeks away. *Note: My last calculation for this target was wrong. I am swapping over my main and alternate wave counts. The new main wave count has a much better fit and makes more sense. Both expect some downwards movement from here. Charts only tonight. 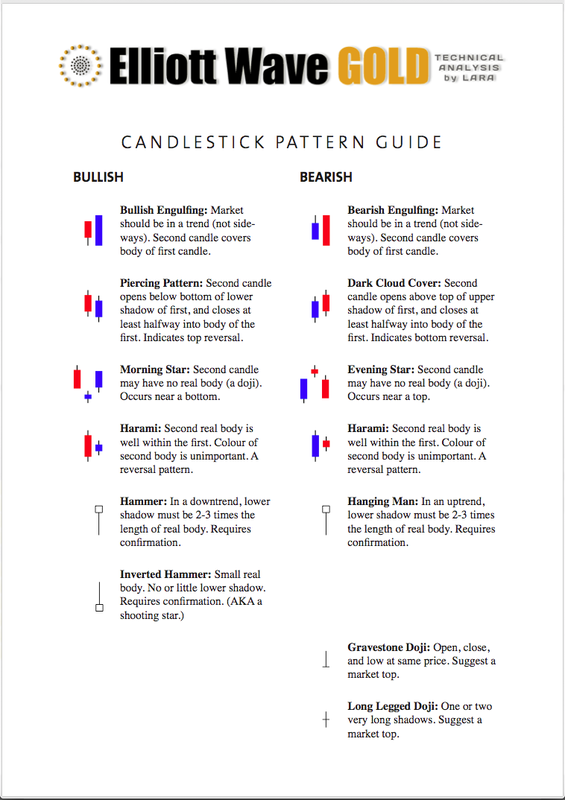 Click charts to enlarge. Minute wave c = 1.618 minute wave a at 21.68. 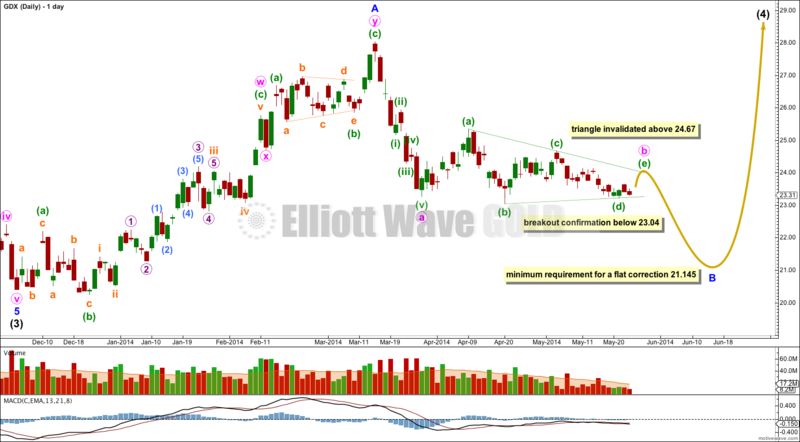 Last Elliott wave analysis three days ago expected upwards movement for GDX. The target for it to end is 26.18. At the time of writing it is getting very close to this target. 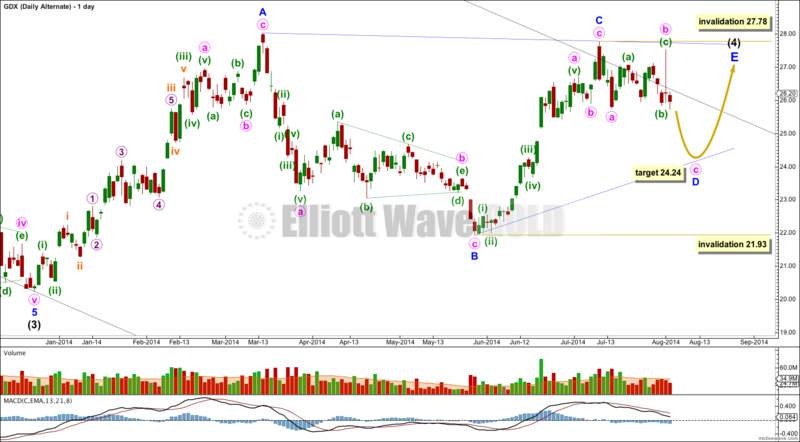 I expect that intermediate wave (4) is completing as a regular contracting triangle. Within the triangle all the subwaves must subdivide as corrective structures, one may be a multiple, and four of the five waves must be zigzags or multiple zigzags. So far minor wave A is a multiple so this means all the remaining subwaves must be simple A-B-C corrections. Minor wave A is technically a double combination so this means all the remaining waves must be simple zigzags. Minor wave D may not move below the end of minor wave D at 21.93, although if the triangle is a barrier triangle minor wave D may end about the same level as minor wave B as long as the B-D trend line is essentially flat. This invalidation point is not black and white. Minor wave C may not move beyond the end of minor wave A above 28.03. This invalidation point is black and white. Overall this wave count now expects to see very choppy overlapping sideways movement for several weeks yet before this correction is over. 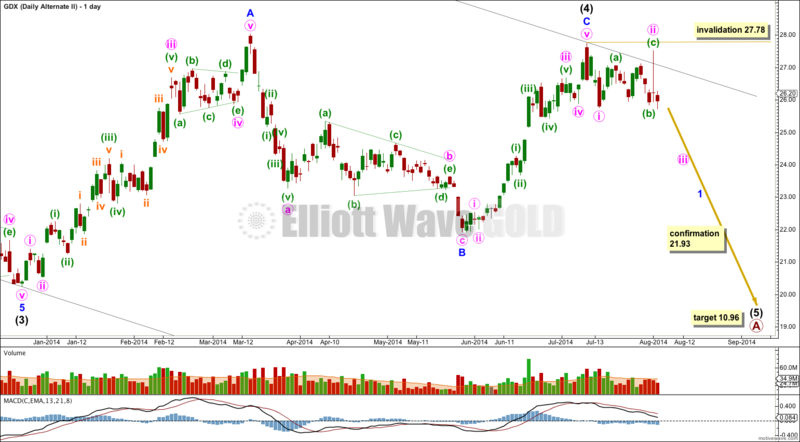 The structure of the daily chart for GDX looks remarkably similar to Gold. 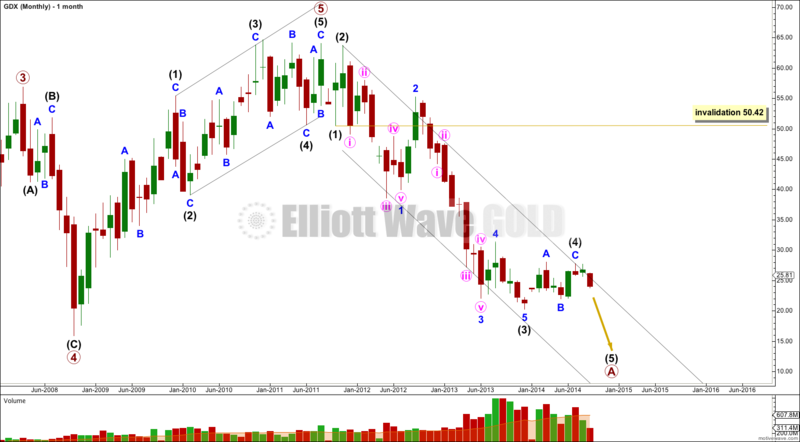 This wave count supports the current wave count for Gold. Intermediate wave (4) should last one to a few months. 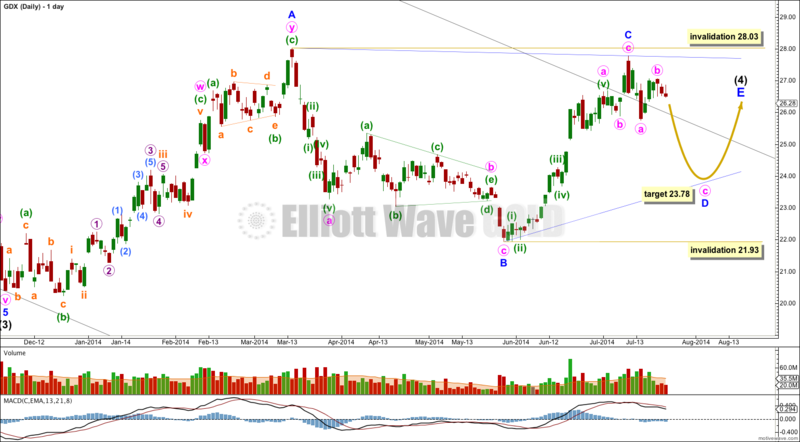 It may end about the terminus of the fourth wave of one lesser degree at $31.35. At this stage I expect intermediate wave (4) is incomplete. I have moved the degree of labeling for the first wave up labeled now minor wave A down one degree; I expect this is just minor wave A and not intermediate wave (4) in its entirety. I have done this because the most recent movement suggests a contracting triangle is unfolding. If intermediate wave (5) has begun this triangle would be in a second wave position, and that does not make sense. 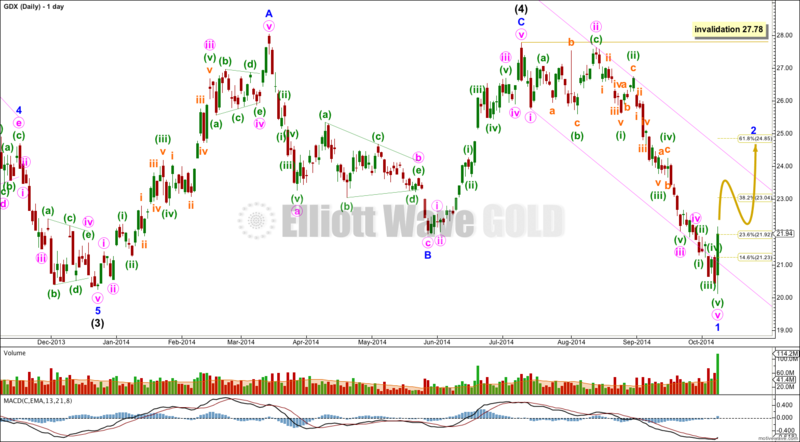 At this stage I would expect that minuette wave (e) is incomplete and price should move a little higher to end it. Minuette wave (e) may not move beyond the end of minuette wave (c) at 24.67. 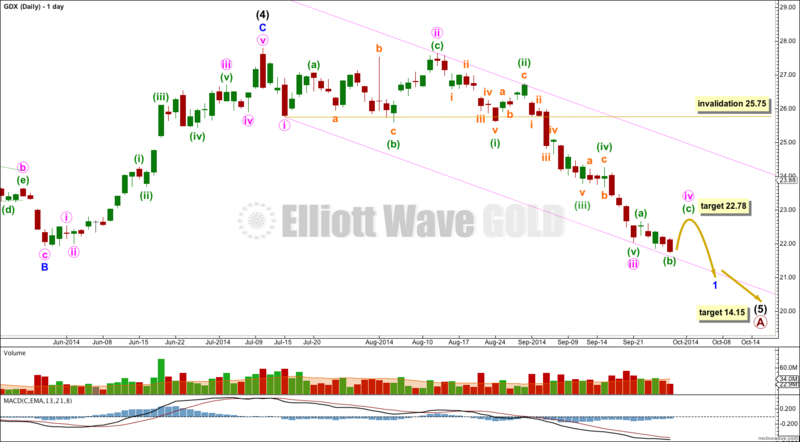 If price moves above this point then my wave count is wrong, and I would expect some more upwards movement. The triangle would be confirmed as complete when price moves below 23.04. 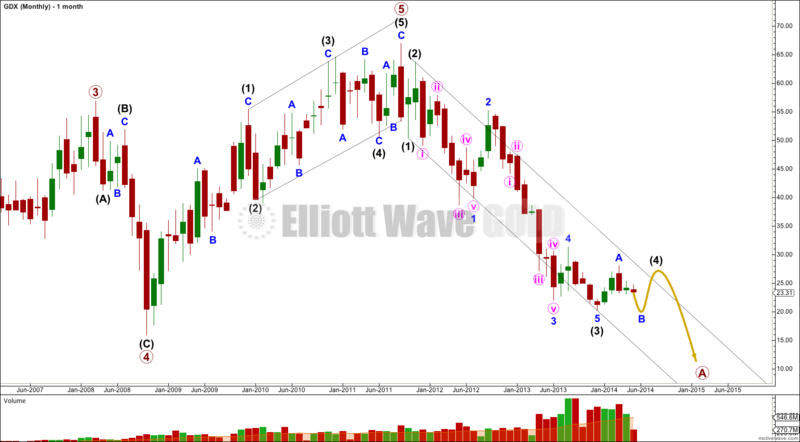 Minuette wave (d) may not move beyond the end of minuette wave (b), and so at that stage downwards movement could not be a continuation of minuette wave (d) and the triangle would have to be over. If intermediate wave (4) is unfolding as a flat correction then within it minor wave B downwards must reach a minimum 90% length of minor wave A at 21.145. 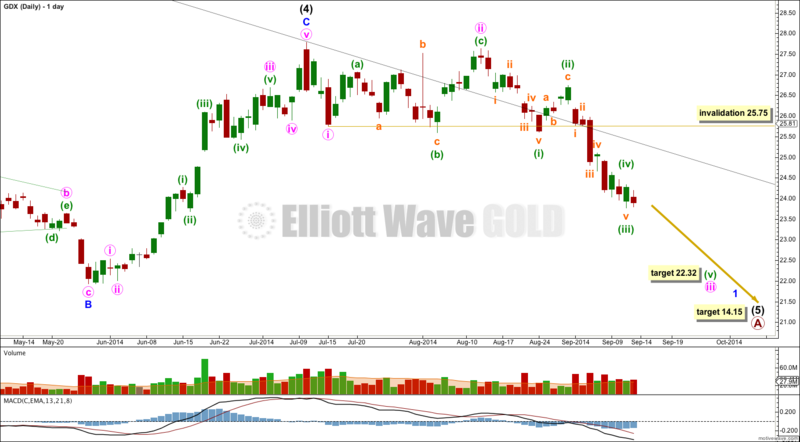 The data for this market has many gaps, and the structures are not entirely typical looking Elliott wave structures. 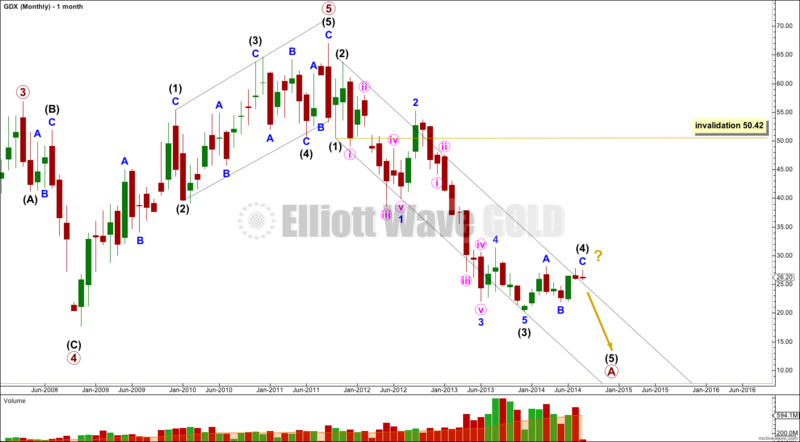 Although there are some Fibonacci ratios, they are not as prevalent as ratios within Gold. I am only able to import daily data, and I cannot check subdivisions on lower time frames. While I expect my analysis of GDX will be useful to you, please note that it may not have as good an accuracy rate as what I can achieve for Gold. 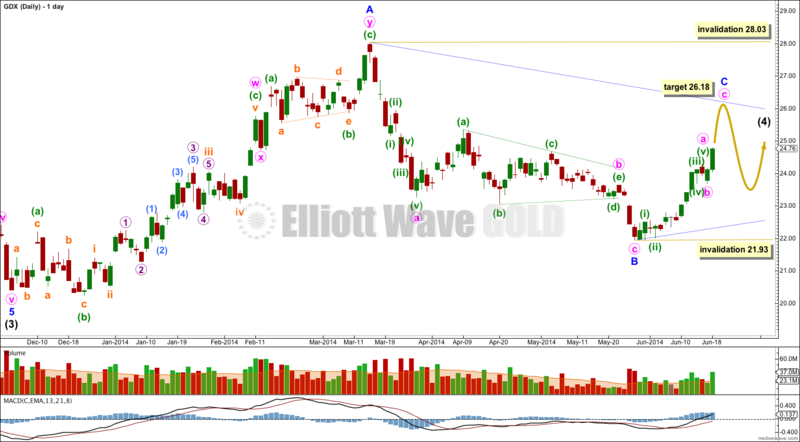 Overall the structures and the wave count will be quite different from Gold. Although it looks these two markets have major turns together, the subdivisions within each are quite different.